Sway Bar Stabilizer Links – Adjustable, Heavier Aftermarket Bars for BMW 2002. 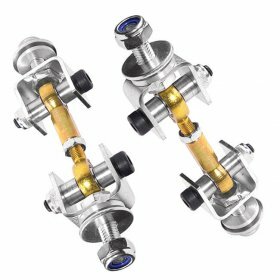 These adjustable sway bar links for BMW 2002 may be used in either the front or rear locations to allow for the removal of preload on the front or rear sway bar. They are specifically designed to be used with heavier aftermarket sway bars that use the factory mounting points. Fine tuning your front sway bar setup requires the ability to adjust your sway bar links which cannot be done with the factory end links. Set of two. Our links include precision CNC’d aluminum spacers to allow rotation of the bearing within the mounting brackets. Unlike other links, our sway bar links come with new CNC laser-cut mounting brackets, high-quality, Teflon-lined race-spec rod ends and come complete with all necessary mounting hardware for an easy installation.